Manipur Legislative Assembly Secretariat released the result of the Direct recruitment to one vacant post of committee Officer on regular basis in the Manipur Legislative Assembly Secretariat. Interview/ viva- voce of the recruitment was held on 5th Feb 2019. 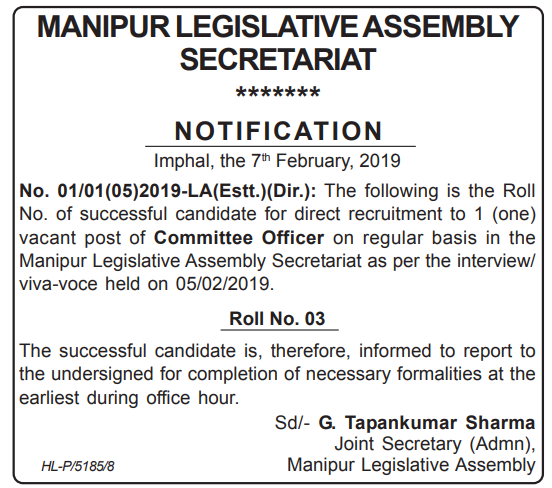 Its has been informed to the successful candidate to report to Joint Secretary (Admin), Manipur Legislative Assembly for completion of necessary formalities at the earliest during office hour.